The other day, The Wall Street Journal paraphrased an old clichéd philosophical question. “When the cost of a hamburger patty soars, does it count as inflation?” The article, co-written by Ben Leubsdorf (who is familiar to New Hampshire politicos and Concord Monitor readers), said that Fed minds “sometimes look past food-price increases that appear temporary or isolated…” But that viewpoint neglects the actual impact to families’ weekly and monthly budgets. The element most often left out of some economists’ thinking, and policy-makers for that matter, is the human one. For it is the individual human decision that creates the effect driven by economic or other policy decisions. 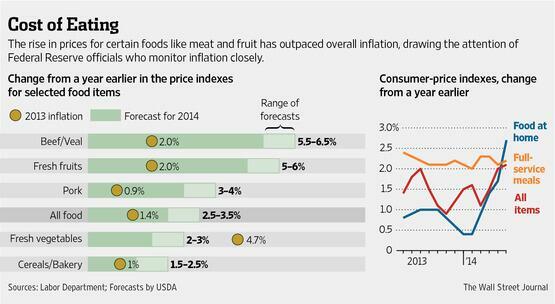 What will families do when faced with four percent-plus projected inflation for meat and fruit and three percent-plus for vegetables? There are two options – less spending or more income. With a somewhat tighter jobs market, higher wages might be just around the corner, also fueling inflationary pressures. We heard recently on CNBC from Tilman Fertitta, CEO of Landry’s, one of America’s largest restaurant ownership companies, “You’re going to be paying $1 more an entrée in every restaurant in America.” If this ain’t inflation well I don’t know what is.